The Particle Filter block estimates the states of a discrete-time nonlinear system using the discrete-time particle filter algorithm. You create the nonlinear state transition function and measurement likelihood functions for the system and specify these functions in the block. The block supports state estimation of a system with multiple sensors that are operating at different sampling rates. You can specify up to five measurement likelihood functions, each corresponding to a sensor in the system. Measured system outputs corresponding to each measurement likelihood function that you specify in the block. The number of ports equals the number of measurement likelihood functions in your system. You can specify up to five measurement likelihood functions. For example, if your system has two sensors, you specify two measurement likelihood functions in the block. The first port y1 is available by default. Click Add Measurement, to generate port y2 corresponding to the second measurement likelihood function. Specify the ports as N-dimensional vectors, where N is the number of quantities measured by the corresponding sensor. For example, if your system has one sensor that measures the position and velocity of an object, then there is only one port y1. The port is specified as a two-dimensional vector with values corresponding to position and velocity. The first port y1 is available by default. Ports y2 to y5 are generated when you click Add Measurement. Optional input argument to the state transition function f other than the state x. If you create f using a MATLAB® function (.m file), the software generates the port StateTransitionFcnInputs when you enter the name of your function, and click Apply. If your state transition function has more than one additional input, use a Simulink Function block to specify the function. When you use a Simulink Function block, you provide the additional inputs directly to the Simulink Function block using Inport blocks. No input ports are generated for the additional inputs in the Particle Filter block. You specify f in Function using a MATLAB function, and f is on the MATLAB path. f requires only one additional input argument apart from particles. Optional inputs to the measurement likelihood functions other than the state x and measurement y.
MeasurementLikelihoodFcn1Inputs corresponds to the first measurement likelihood function that you specify, and so on. If you specify two measurement inputs using MATLAB functions (.m files) in Function, the software generates ports MeasurementLikelihoodFcn1Inputs and MeasurementLikelihoodFcn2Inputs when you click Apply. You can specify the inputs to these ports as scalars, vectors, or matrices. If your measurement likelihood functions have more than one additional input, use Simulink Function blocks to specify the functions. When you use a Simulink Function block, you provide the additional inputs directly to the Simulink Function block using Inport blocks. No input ports are generated for the additional inputs in the Particle Filter block. You specify measurement input h in Function using a MATLAB function, and h is on the MATLAB path. h requires only one additional input argument apart from particles and measurement. Enable correction of estimated states when measured data is available. For example, consider that measured output data is not available at all time points at the port y1 that corresponds to the first measurement likelihood function. Then, use a signal value other than 0 at the Enable1 port to enable the correction of estimated states when measured data is available. Specify the port value as 0 when measured data is not available. Similarly, if measured output data is not available at all time points at the port yi for the ith measurement likelihood function, specify the corresponding port Enablei as a value other than 0. If you select Add Enable port for a measurement likelihood function, a port corresponding to that measurement likelihood function is generated. The port appears when you click Apply. Estimated states, returned as a vector of size Ns, where Ns is the number of states of the system. To access the individual states, use the Selector block. When the Use the current measurements to improve state estimates parameter is selected, the block outputs the corrected state estimate x^[k|k] at time step k, estimated using measured outputs until time k. If you clear this parameter, the block returns the predicted state estimate x^[k|k−1] for time k, estimated using measured output until a previous time k-1. Clear this parameter if your filter is in a feedback loop and there is an algebraic loop in your Simulink® model. State estimation error covariance, returned as an Ns-by-Ns matrix, where Ns is the number of states of the system. To access the individual covariances, use the Selector block. You can output the error covariance only if you select Output state estimation error covariance in the Block outputs, Multirate tab, and click Apply. This parameter is available if in the Block outputs, Multirate tab, the State estimation method parameter is set to 'Mean'. Particle values used for state estimation, returned as an Ns-by-Np or Np-by-Ns array. Ns is the number of states of the system, and Np is the number of particles. If the StateOrientation parameter is specified as 'column', then Particles is returned as an Ns-by-Np array. If the StateOrientation parameter is specified as 'row', then Particles is returned as an Np-by-Ns array. This port is generated if you select Output all particles in the Block outputs, Multirate tab, and click Apply. Particle weights used for state estimation, returned as a 1-by-Np or Np-by-1 vector, where Np is the number of particles used for state estimation. If the StateOrientation parameter is specified as 'column', then Weights is returned as a 1-by-Np vector, where each weight is associated with the particle in the same column in the Particles array. If the StateOrientation parameter is specified as 'row', then Weights is returned as a Np-by-1 vector, where each weight is associated with the particle in the same row in the Particles array. This port is generated if you select Output weights in the Block outputs, Multirate tab, and click Apply. where, particles and particlesNext have dimensions Ns-by-Np if State Orientation is specified as 'column', or Np-by-Ns if State Orientation is specified as 'row'. Also, param_i represents optional input arguments you may specify. For more information on optional input arguments, see StateTransitionFcnInputs. You create the state transition function and specify the function name in Function. For example, if vdpParticleFilterStateFcn.m is the state transition function that you created and saved, specify Function as 'vdpParticleFilterStateFcn'. You can create Function using a Simulink Function block or as a MATLAB function (.m file). Number of particles used in the filter, specified as a positive scalar integer. Each particle represents a state hypothesis in the system. A higher number of particles increases the state estimation accuracy, but also increases the computational effort required to run the filter. Initial distribution of particles, specified as 'Gaussian', 'Uniform', or 'Custom'. If you choose 'Gaussian', the initial set of particles or state hypotheses are distributed per the multivariate Gaussian distribution, where you specify the Mean and Covariance. The initial weight of all particles is assumed to be equal. If you choose 'Uniform', the initial set of particles are distributed per the uniform distribution, where you specify the upper and lower State bounds. The initial weight of all particles is assumed to be equal. 'Custom' allows you to specify your own set of initial particles and their weights. You can use arbitrary probability distributions for Particles and Weights to initialize the filter. Initial mean value of particles, specified as a vector. The number of states to be estimated defines the length of the vector. This parameter is available if in the System model tab, the Distribution parameter is set to Gaussian. Initial covariance of particles, specified as a scalar, vector, or matrix. A scalar, then it must be positive. The covariance is assumed to be a [Ns Ns] matrix with this scalar on the diagonals. Here, Ns is the number of states. A vector, then each element must be positive. The covariance is assumed to be a [Ns Ns] matrix with the elements of the vector on the diagonals. A matrix, then it must be positive semidefinite. Circular variables used for state estimation, specified as a scalar, or Ns-element vector, where Ns is the number of states. If Circular Variables is specified as a scalar, the software extends it to a vector where each element is equal to this scalar. Circular (or angular) distributions use a probability density function with a range of [-π π]. Use circular variables if some of the states in your system represent angular quantities like the orientation of an object. Orientation of system states, specified as 'column' or 'row'. 'column', then the first input argument to the state transition and measurement likelihood function is [Ns Np]. In this case, ith column of this matrix is the ith particle (state hypothesis). Also, the states estimates xhat is output as a [Ns 1] vector. Here, Ns is the number of states, and Np is the number of particles. 'row', then the first input argument to the state transition and measurement likelihood function is [Np Ns], and each row of this matrix contains a particle. Also, the states estimates xhat is output as a [1 Ns] vector. Initial bounds on system states, specified as an Ns-by-2 array, where Ns is the number of states. The ith row lists the lower and upper bound of the uniform distribution for the initial distribution of particles of the ith state. 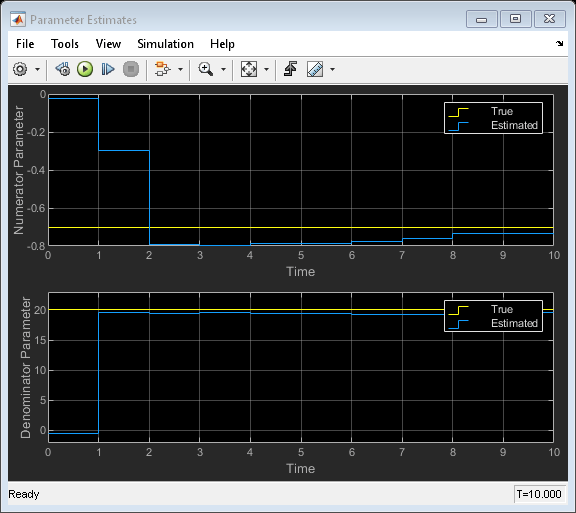 This parameter is available if in the System model tab, the Distribution parameter is set to Uniform. Custom particle distribution for state estimation, specified as an Ns-by-Np or Np-by-Ns array. Ns is the number of states of the system, and Np is the number of particles. If the StateOrientation parameter is specified as 'column', then Particles is an Ns-by-Np array. If the StateOrientation parameter is specified as 'row', then Particles is an Np-by-Ns array. This parameter is available if in the System model tab, the Distribution parameter is set to Custom. Custom particle weight values for state estimation, specified as a 1-by-Np or Np-by-1 positive vector, where Np is the number of particles used for state estimation. If the StateOrientation parameter is specified as 'column', then Weights is a 1-by-Np vector. Each weight in the vector is associated with the particle in the same column in the Particles array. If the StateOrientation parameter is specified as 'row', then Weights is a Np-by-1 vector. Each weight in the vector is associated with the particle in the same row in the Particles array. where, likelihood is an Np-element vector, where Np is the number of particles. particles have dimensions Ns-by-Np if State Orientation is specified as 'column', or Np-by-Ns if State Orientation is specified as 'row'. measurement is an Nm-element vector where, Nm is the number of measurements your sensor provides. param_i represents optional input arguments you may specify. For more information on optional input arguments, see MeasurementLikelihoodFcn1Inputs,...,MeasurementLikelihoodFcn5Inputs. You create the measurement likelihood function and specify the function name in Function. For example, if vdpMeasurementLikelihoodFcn.m is the measurement likelihood function that you created and saved, specify Function as 'vdpMeasurementLikelihoodFcn'. You can use a MATLAB function only if h has zero or one additional input argument param_i other than Particles and Measurement. The software generates an additional input port MeasurementLikelihoodFcniInputs to specify this argument for the ith measurement likelihood function, and click Apply. If you are using a Simulink Function block, specify x and y using Argument Inport blocks and the additional inputs param_i using Inport blocks in the Simulink Function block. You do not provide param_i to the Particle Filter block. If you have multiple sensors in your system, you can specify multiple measurement likelihood functions. You can specify up to five measurement likelihood functions using the Add Measurement button. To remove measurement likelihood functions, use Remove Measurement. Suppose that measured output data is not available at all time points at the port y1 that corresponds to the first measurement likelihood function. To generate an input port Enable1, select Add Enable port. Use a signal at this port to enable the correction of estimated states only when measured data is available. Similarly, if measured output data is not available at all time points at the port yi for the ith measurement likelihood function, select the corresponding Add Enable port. Method to determine when resampling occurs, specified as either 'Ratio' or 'Interval'. The 'Ratio' value triggers resampling based on the ratio of effective total particles. The 'Interval' value triggers resampling at regular time steps of the particle filter operation. Minimum desired ratio of the effective number of particles to the total number of particles, specified as a positive scalar. The effective number of particles is a measure of how well the current set of particles approximates the posterior distribution. A lower effective particle ratio implies that a lower number of particles are contributing to the estimation and resampling is required. If the ratio of the effective number of particles to the total number of particles falls below the minimum effective particle ratio, a resampling step is triggered. Specify minimum effective particle ratio as any value from 0 through 1. This parameter is available if in the System model tab, the Trigger method parameter is set to Ratio. Fixed interval between resampling, specified as a positive scalar integer. The sampling interval determines during which correction steps the resampling is executed. For example, a value of two means the resampling is executed every second correction step. A value of inf means that resampling is never executed. This parameter is available if in the System model tab, the Trigger method parameter is set to Interval. Whether the random numbers are repeatable, specified as either 'Repeatable' or 'Not repeatable'. If you want to be able to produce the same result more than once, set Randomness to 'Repeatable', and specify the same random number generator seed value in Seed. Seed value for repeatable random numbers, specified as a scalar. This parameter is available if in the System model tab, the Randomness parameter is set to 'Repeatable'. Block sample time, specified as a positive scalar. Use the Sample time parameter if your state transition and all measurement likelihood functions have the same sample time. Otherwise, select the Enable multirate operation option in the Multirate tab, and specify sample times in the same tab. This parameter is available if in the Block output, Multirate tab, the Enable multirate operation parameter is off. 'Mean' — The Particle Filter block outputs the weighted mean of the particles, depending on the parameters Weights and Particles, as the state estimate. 'Maxweight' — The Particle Filter block outputs the particle with the highest weight as the state estimate. 'None' — Use this option to implement a custom state estimation method by accessing all particles using the Output all particles parameter from the Block outputs, Multirate tab. If you select this parameter, an output port for particles used in the estimation, Particles is generated in the block. If the StateOrientation parameter is specified as 'column', then the particles are output as an Ns-by-Np array. Ns is the number of states of the system, and Np is the number of particles. If the StateOrientation parameter is specified as 'row', then the particles are output as an Np-by-Ns array. If you select this parameter, an output port for particle weights used in the estimation, Weights is generated in the block. If the StateOrientation parameter is specified as 'column', then the particle weights are output as a 1-by-Np vector. Here, where each weight is associated with the particle in the same column in the Particles array. Np is the number of particles used for state estimation. If the StateOrientation parameter is specified as 'row', then the particle weights are output as a Np-by-1 vector. If you select this parameter, a state estimation error covariance output port, P is generated in the block. When this parameter is selected, the block outputs the corrected state estimate x^[k|k] at time step k, estimated using measured outputs until time k. If you clear this parameter, the block returns the predicted state estimate x^[k|k−1] for time k, estimated using measured output until a previous time k-1. Clear this parameter if your filter is in a feedback loop and there is an algebraic loop in your Simulink model. Select this parameter if the sample times of the state transition or any of the measurement likelihood functions differ from the rest. You specify the sample times in the Multirate tab, in Sample time. Ports corresponding to state transition function — Additional input to state transition function StateTransitionFcnInputs. The sample times of these ports must always equal the state transition function sample time, but can differ from the sample time of the measurement likelihood functions. Ports corresponding to ith measurement likelihood function — Measured output yi, additional input to measurement likelihood function MeasurementLikelihoodFcniInputs, enable signal at port Enablei. The sample times of these ports for the same measurement likelihood function must always be the same, but can differ from the sample time for the state transition function and other measurement likelihood functions. This parameter is available if in the Block outputs, Multirate tab, the Enable multirate operation parameter is on. Demonstrates the use of Particle Filter block in Control System Toolbox™. A discrete-time transfer function parameter estimation problem is reformulated and recursively solved as a state estimation problem. 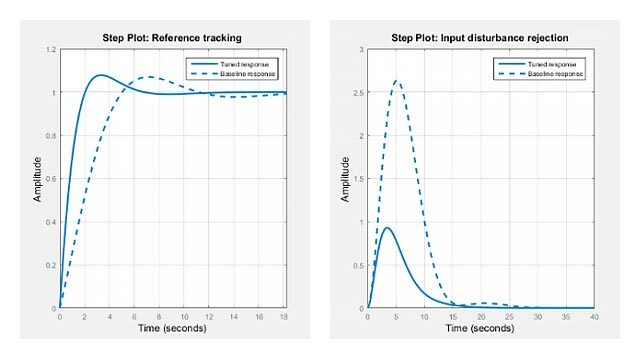 The state transition and measurement likelihood functions that you specify must use only the MATLAB commands and Simulink blocks that support code generation. For a list of blocks that support code generation, see Simulink Built-In Blocks That Support Code Generation (Simulink Coder). For a list of commands that support code generation, see Functions and Objects Supported for C/C++ Code Generation — Category List (MATLAB Coder).